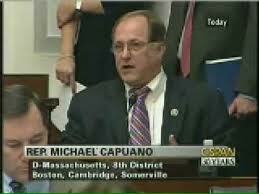 What does Mike Capuano know that the rest of us don't? Apparently, very little about bombing raids on Libya (Obama Administration honchos haven't briefed him) and perhaps quite a bit about America's post-2012 landscape. Appearing on libtalk's Stephanie Miller Show, the longtime Massachusetts Democratic representative spoke out against Obama's Libyan bombing raids because they could open the door for "President Palin" to "invade Iran". Has war become nothing more than a partisan issue? Another key question: why do "progressives" seem so fatalistic about Sarah Palin running for president and winning? FILL-IN HOST HAL SPARKS (1:21:45): By the way, I’ve said respectively there is a tremendous amount of positive debate going on on the left side of the aisle where meaningful people who really do have good intentions are having a conversation about the validity of Operation Odyssey Dawn and the you know action in Libya and on the right there just seems to be a clamor to be on the opposite side of the president regardless of circumstance no matter what. SPARKS (1:22:52): Give me your assessment of sort of where we are with Libya and where we need to be going. SPARKS: And use that same power. CAPUANO: ha ha ha. And so for me I want to think that this is the right thing to do, but honestly all I know about the issue is what I have learned through the media and I think that’s an inappropriate way to go and I think the president I hope the president comes to Congress this week and number on explains it to us better, explains what his goals are, what he thinks we should be doing. Why we are there as opposed to not in Sudan and not in Yemen? And I do think those arguments can be made, but nonetheless I thinks it’s incumbent on him to do it and I’d like to hear those discussions. Hey Mike, why not ask Acting President Hillary Clinton? She might at least be in the country and available to take your questions. Attack Iran?? Oh we can't have that. I just love how she makes their heads explode.